Pgh Momtourage: Join Amazon Mom and get $20 off your first pack of select diapers! 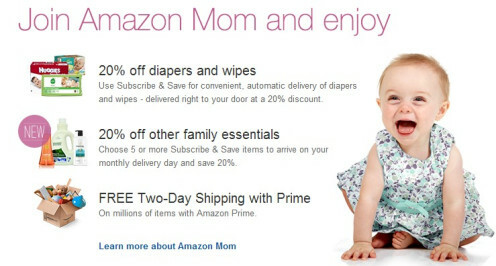 Join Amazon Mom and get $20 off your first pack of select diapers! If you’re a current parent, expecting a little one, or are a caretaker of kiddos, then you’ll definitely want to take note of Amazon Mom (if you don’t already know about this great program). Amazon Mom is currently offering up a ton of awesome benefits including an extra $20 off your first pack of select diapers with promo code BABYDEAL at checkout! * Snag an additional 20% discount on select diapers and wipes when you sign up for Subscribe & Save delivery (you can easily cancel or change shipments at anytime). * Score 3 months of FREE Two-Day shipping with Amazon Prime (this is an awesome perk!). 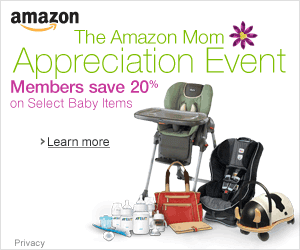 * Exclusive discounts and deals for Amazon Mom members! If you’ve already paid for an Amazon Prime membership and you sign up for Amazon Mom, your Prime membership won’t change – they’ll just add your Amazon Mom membership to your account. Also, if you don’t already have an Amazon Prime membership, after your 3-month free trial period, you’ll be automatically upgraded to Amazon Prime for $79 per year (unless you decide to opt out – which you can do online). * If you’re a member of Amazon Student and have already received the Amazon Student free shipping benefits, you are not eligible to receive free shipping benefits from Amazon Mom. However, you will still be eligible for offers exclusive to Amazon Mom members such as 20% off select diapers and wipes. Free Father's Day card for new Treat customers! *HOT* $10 off $25 purchase at Abe's Market! RiverQuest riverboat - tickets under $10! Win a week of summer camp!